Pope Francis has been outspoken about ending world hunger, and getting the church more involved. This has to be done. What, though, are some ways citizens can help in terms of advocacy? One answer can be found by looking to South Sudan. As we speak Catholic Relief Services (CRS) is helping war victims there by giving food. These are rations to help families who have been displaced by fighting between the government and opposition forces. CRS is also providing seeds. This allows farmers, who have lost so much, the chance to grow crops. That is critical for hopes of avoiding a famine in the country. How is this being funded? It's through a grant from the U.S. Food for Peace program, which is operated by the U.S. Agency for International Development (USAID). 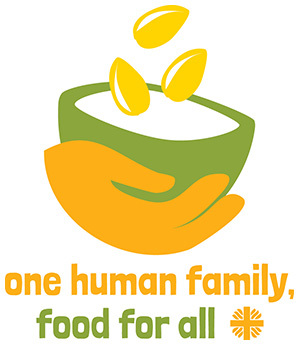 Food for Peace is the main tool of the U.S. government for fighting world hunger. It is a donor to CRS and other agencies that work in impoverished countries. Food for Peace is the single largest donor to the UN World Food Programme (WFP), which is the largest of these agencies. To advocate to end world hunger is to support Food for Peace. Write to your representative about funding Food for Peace, giving it the priority it deserves. Think about the history too. After the first two world wars, the U.S. responded to feed the starving in many countries. They realized after these experiences the need for a lasting program to fight hunger. Food for Peace got its start really from that history. It was signed into law by President Dwight Eisenhower in 1954. It quickly went to work helping in places like Korea, which was also struck by war. What Food for Peace needs today is enough funding to play its significant role in ending world hunger. "In order to meet the needs of our brothers and sisters facing hunger due to emergency situations and working with them to build long-term solutions to end hunger, this program must be funded at a minimum of $1.55 billion for fiscal year 2015 and there should be maximum flexibility in the way these resources are used." Food for Peace is especially critical at a time when we are facing famine in South Sudan, Central African Republic and Syria. The donations are vital for feeding the hungry and demonstrating the leadership in encouraging other nations to do more to help. For the long-term, it's about building the self-sufficiency of a nation. How can that be done? It takes peacemaking, for one, to prevent further conflicts. It also means developing the agriculture in a country like South Sudan. CRS, before the conflict started, had a food security program in Jonglei, which is the largest state in South Sudan. It was funded by USAID. The Jonglei Food Security program is about farmers growing their own crops. CRS is there to educate and provide assistance to get them started. Adhuom Achiek Buol, a farmer in South Sudan, told Sara Fajardo of CRS, "Farming will stop hunger. We, the people of Jonglei, were created to farm. It is in our culture. It is what we were born to do." As Pope Francis said, "A way has to be found to enable everyone to benefit from the fruits of the earth, and not simply to close the gap between the affluent and those who must be satisfied with the crumbs falling from the table, but above all to satisfy the demands of justice, fairness and respect for every human being." Something like the CRS work in South Sudan is far away from our own homes, but you can help them, even with a simple letter. As little as eight people contacting their elected official can help bring an issue like Food for Peace to the forefront. That is how to help end world hunger.